A. J. Fikry practices a profession that every reader imagined to do at least once in a lifetime: the bookseller. "The Island Books" is his den, inserted in an humble village, pretty far from the urban areas (is my insignificant village situated better than his? Astonishing!). And, like we could guess from the title, this is the partial story of his personal life after the death of her wife, Nicole. He seems to be doomed to a certain precarious economical situation and to an average and ungraceful loneliness, but that's not the plan thought for him by Gabrielle Zevin, like we could gess only from the simple premise. The novel is, above all, a greedy buffet of literary references and quotations. Just an example: every chapter has a tiny introduction, where A. J. comments a short story significant for that tile of his life, given that he thinks that short stories are the perfect literary form. The quoted names are varied: Edgar Allan Poe, Roald Dahl, but also Flannery O'Connor, Aimee Bender, Grace Paley and so on. That's a right demonstration of the freshness and modernity of this novel, which proposes itself as a book about books. It's different from the other novels I read of the same genre: I mean, one reference is about a book released when..a year ago? two years ago? Wow! In fact this is the most adorable element of the whole book: it makes you feel so happily nerd. But the characters are also extremely likable, particulary for A. J. He's the right mix between the typical spite of a not so cheerful and social personality and a humor and basic goodness which are the elements of a winning character. There is a but, however. Beyond the hodgepodge of literary delicacies, the story itself is very predictable, you can deduce the main turning points upfront. Its predictability is shaded by its amazing pleasantness and verve, but the lacks are still evident. 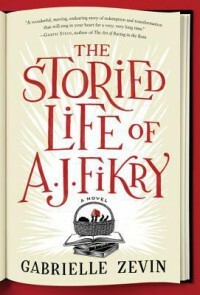 I would add to the title another adjective, "The Summarized Life of A. J. Fikry", because the author doesn't hesitate to turbocharge the essential progresses of A. J. 's life. Right in the points where the emotive side of the story could have gained something more (the relationship with Maya, Amelia but others too) the cuts are notable, and the narration results as a large-scale account embroidered with specific facts. Better to not talk about the ending, which is not simply predictable, but an embarassing cliché. Not necessary at all. It's a pity: if Gabrielle Zevin had developped more these elements, the novel would have been a five-stars read.